In September of 2016, the color guard community and the Field of View family lost someone very special, Michelle Owens. Michelle was well known for her "smile" which instantly brought a very special light and warmth to each interaction she had with members and staff. She loved this activity and exuded passion, dedication, creativity, encouragement and a positive attitude to all who were fortunate enough to be her students or colleagues. Michelle was a member of Field of View in 1994 and 1995, a staff member in 1998, and director in 1999. Michelle returned to Field of View in 2015 as a choreographer and staff member. She traveled with the guard to Canada and New York City as they performed in a once in a lifetime opportunity in David Byrne's Contemporary Color. As always, Michelle met up with many old friends and acquired a new group of friends and admirers with her welcoming demeanor and genuine interest in people and their stories. 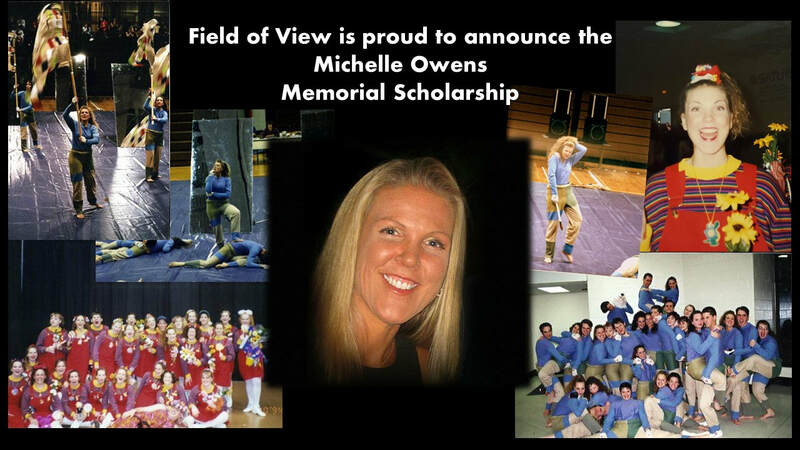 To honor Michelle's contribution to the winter guard activity and Field of View we have established, in conjunction with Jeff Sacktig, the Michelle Owens Memorial Scholarship. Our wish is to award this scholarship each year to a member of the guard who embodies Michelle's many wonderful characteristics. If you wish to contribute to Michelle’s scholarship, please click on the donation button below.